Not to be confused with Saurischia. Sauropoda (/sɔːˈrɒpədə/ or /ˌsɔːrəˈpoʊdə/), or the sauropods (/ˈsɔːrəpɒdz/; sauro- + -pod, "lizard-footed"), are a clade of saurischian ("lizard-hipped") dinosaurs. They had very long necks, long tails, small heads (relative to the rest of their body), and four thick, pillar-like legs. They are notable for the enormous sizes attained by some species, and the group includes the largest animals to have ever lived on land. 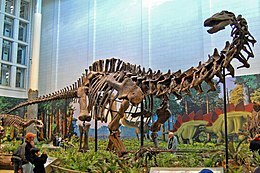 Well-known genera include Brachiosaurus, Diplodocus, Apatosaurus, Brontosaurus, and Mamenchisaurus . Sauropods first appeared in the late Triassic Period, where they somewhat resembled the closely related (and possibly ancestral) group "Prosauropoda". By the Late Jurassic (150 million years ago), sauropods had become widespread (especially the diplodocids and brachiosaurids). By the Late Cretaceous, those groups had mainly been replaced by the titanosaurs, which had a near-global distribution. However, as with all other non-avian dinosaurs alive at the time, the titanosaurs died out in the Cretaceous–Paleogene extinction event. Fossilised remains of sauropods have been found on every continent, including Antarctica. The name Sauropoda was coined by O.C. Marsh in 1878, and is derived from Greek, meaning "lizard foot". Sauropods are one of the most recognizable groups of dinosaurs, and have become a fixture in popular culture due to their large sizes. Complete sauropod fossil finds are rare. Many species, especially the largest, are known only from isolated and disarticulated bones. Many near-complete specimens lack heads, tail tips and limbs. Sauropods were herbivorous (plant-eating), usually quite long-necked quadrupeds (four-legged), often with spatulate (spatula-shaped: broad at the tip, narrow at the neck) teeth. They had tiny heads, massive bodies, and most had long tails. Their hind legs were thick, straight, and powerful, ending in club-like feet with five toes, though only the inner three (or in some cases four) bore claws. Their forelimbs were rather more slender and typically ended in pillar-like hands built for supporting weight; often only the thumb bore a claw. Many illustrations of sauropods in the flesh miss these facts, inaccurately depicting sauropods with hooves capping the claw-less digits of the feet, or more than three claws or hooves on the hands. The proximal caudal vertebrae are extremely diagnostic for sauropods. The sauropods' most defining characteristic was their size. Even the dwarf sauropods (perhaps 5 to 6 metres, or 20 feet long) were counted among the largest animals in their ecosystem. Their only real competitors in terms of size are the rorquals, such as the blue whale. But, unlike whales, sauropods were primarily terrestrial animals. Their body structure did not vary as much as other dinosaurs, perhaps due to size constraints, but they displayed ample variety. Some, like the diplodocids, possessed tremendously long tails, which they may have been able to crack like a whip as a signal or to deter or injure predators, or to make sonic booms. Supersaurus, at 33 to 34 metres (108 to 112 ft) long, was the longest sauropod known from reasonably complete remains, but others, like the old record holder, Diplodocus, were also extremely long. The holotype (and now lost) vertebra of Amphicoelias fragillimus may have come from an animal 58 metres (190 ft) long; its vertebral column would have been substantially longer than that of the blue whale. However, a research published in 2015 speculated that the size estimates of A. fragillimus may have been highly exaggerated. The longest dinosaur known from reasonable fossils material is probably Argentinosaurus huinculensis with length estimates of 25 metres (82 ft) to 39.7 metres (130 ft). The longest terrestrial animal alive today, the reticulated python, only reaches lengths of 6.95 metres (22.8 ft). 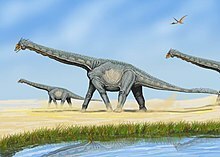 Others, like the brachiosaurids, were extremely tall, with high shoulders and extremely long necks. Sauroposeidon was probably the tallest, reaching about 18 metres (60 ft) high, with the previous record for longest neck being held by Mamenchisaurus. By comparison, the giraffe, the tallest of all living land animals, is only 4.8 to 5.5 metres (16 to 18 ft) tall. The best evidence indicates that the most massive were Argentinosaurus (120 metric tons), Puertasaurus (80 to 100 metric tons ), Alamosaurus, Paralititan, Antarctosaurus (69 metric tons). There was poor (and now missing) evidence that so-called Bruhathkayosaurus, might have weighed over 175 metric tons but this has been questioned. The weight of Amphicoelias fragillimus was estimated at 122.4 metric tons but 2015 research argued that these estimates may have been highly exaggerated. The largest land animal alive today, the Savannah elephant, weighs no more than 10.4 metric tons (11.5 short tons). Among the smallest sauropods were the primitive Ohmdenosaurus (4 m, or 13 ft long), the dwarf titanosaur Magyarosaurus (6 m or 20 ft long), and the dwarf brachiosaurid Europasaurus, which was 6.2 meters long as a fully-grown adult. Its small stature was probably the result of insular dwarfism occurring in a population of sauropods isolated on an island of the late Jurassic in what is now the Langenberg area of northern Germany. The diplodocoid sauropod Brachytrachelopan was the shortest member of its group because of its unusually short neck. Unlike other sauropods, whose necks could grow to up to four times the length of their backs, the neck of Brachytrachelopan was shorter than its backbone. On or shortly before 29 March 2017 a sauropod footprint about 5.6 feet (1.7 meters) long was found at Walmadany in the Kimberley Region of Western Australia. The report said that it was the biggest known yet. As massive quadrupeds, sauropods developed specialized graviportal (weight-bearing) limbs. The hind feet were broad, and retained three claws in most species. Particularly unusual compared with other animals were the highly modified front feet (manus). The front feet of sauropods were very dissimilar from those of modern large quadrupeds, such as elephants. Rather than splaying out to the sides to create a wide foot as in elephants, the manus bones of sauropods were arranged in fully vertical columns, with extremely reduced finger bones (though it is not clear if the most primitive sauropods, such as Vulcanodon and Barapasaurus, had such forefeet). The front feet were so modified in eusauropods that individual digits would not have been visible in life. The arrangement of the forefoot bone (metacarpal) columns in eusauropods was semi-circular, so sauropod forefoot prints are horseshoe-shaped. Unlike elephants, print evidence shows that sauropods lacked any fleshy padding to back the front feet, making them concave. The only claw visible in most sauropods was the distinctive thumb claw (associated with digit I). Almost all sauropods had such a claw, though what purpose it served is unknown. The claw was largest (as well as tall and laterally flattened) in diplodocids, and very small in brachiosaurids, some of which seem to have lost the claw entirely based on trackway evidence. Titanosaurs may have lost the thumb claw completely (with the exception of early forms, such as Janenschia). Titanosaurs were most unusual among sauropods, as in addition to the external claw, they completely lost the digits of the front foot. Advanced titanosaurs had no digits or digit bones, and walked only on horseshoe-shaped "stumps" made up of the columnar metacarpal bones. Print evidence from Portugal shows that, in at least some sauropods (probably brachiosaurids), the bottom and sides of the forefoot column was likely covered in small, spiny scales, which left score marks in the prints. In titanosaurs, the ends of the metacarpal bones that contacted the ground were unusually broad and squared-off, and some specimens preserve the remains of soft tissue covering this area, suggesting that the front feet were rimmed with some kind of padding in these species. Matthew Bonnan has shown that sauropod dinosaur long bones grew isometrically: that is, there was little to no change in shape as juvenile sauropods became gigantic adults. Bonnan suggested that this odd scaling pattern (most vertebrates show significant shape changes in long bones associated with increasing weight support) might be related to a stilt-walker principle (suggested by amateur scientist Jim Schmidt) in which the long legs of adult sauropods allowed them to easily cover great distances without changing their overall mechanics. Along with other saurischian dinosaurs (such as birds and other theropods), sauropods had a system of air sacs, evidenced by indentations and hollow cavities in most of their vertebrae that had been invaded by them. Pneumatic, hollow bones are a characteristic feature of all sauropods. These air spaces reduced the overall weight of the massive necks that the sauropods had, and the air-sac system in general, allowing for a single-direction airflow through stiff lungs, made it possible for the sauropods to get enough oxygen. The bird-like hollowing of sauropod bones was recognized early in the study of these animals, and, in fact, at least one sauropod specimen found in the 19th century (Ornithopsis) was originally misidentified as a pterosaur (a flying reptile) because of this. Some sauropods had armor. There were genera with small clubs on their tails, like Shunosaurus, and several titanosaurs, such as Saltasaurus and Ampelosaurus, had small bony osteoderms covering portions of their bodies. It was also noted by D'Emic and his team that the differences between the teeth of the sauropods also indicated a difference in diet. Diplodocus ate plants low to the ground and Camarasaurus browsed leaves from top and middle branches. According to the scientists, the specializing of their diets helped the different herbivorous dinosaurs to coexist. Sauropod necks have been found at over 15 metres (49 ft) in length, a full six times longer than the world record giraffe neck. Enabling this were a number of essential physiological features. The dinosaurs’ overall large body size and quadrupedal stance provided a stable base to support the neck, and the head was evolved to be very small and light, losing the ability to orally process food. By reducing their heads to simple harvesting tools that got the plants into the body, the sauropods needed less power to lift their heads, and thus were able to develop necks with less dense muscle and connective tissue. This drastically reduced the overall mass of the neck, enabling further elongation. Sauropods also had a great number of adaptations in their skeletal structure. Some sauropods had as many as 19 cervical vertebrae, whereas almost all mammals are limited to only seven. Additionally, each vertebra was extremely long and had a number of empty spaces in them which would have been filled only with air. An air-sac system connected to the spaces not only lightened the long necks, but effectively increased the airflow through the trachea, helping the creatures to breathe in enough air. By evolving vertebrae consisting of 60% air, the sauropods were able to minimize the amount of dense, heavy bone without sacrificing the ability to take sufficiently large breaths to fuel the entire body with oxygen. According to Kent Stevens, computer-modeled reconstructions of the skeletons made from the vertebrae indicate that sauropod necks were capable of sweeping out large feeding areas without needing to move their bodies, but were unable to be retracted to a position much above the shoulders for exploring the area or reaching higher. Another proposed function of the sauropods’ long necks was essentially a radiator to deal with the extreme amount of heat produced from their large body mass. Considering that the metabolism would have been doing an immense amount of work, it would certainly have generated a large amount of heat as well, and elimination of this excess heat would have been essential for survival. It has also been proposed that the long necks would have cooled the veins and arteries going to the brain, avoiding excessively heated blood from reaching the head. It was in fact found that the increase in metabolic rate resulting from the sauropods’ necks was slightly more than compensated for by the extra surface area from which heat could dissipate. When sauropods were first discovered, their immense size led many scientists to compare them with modern-day whales. Most studies in the 19th and early 20th centuries concluded that sauropods were too large to have supported their weight on land, and therefore that they must have been mainly aquatic. 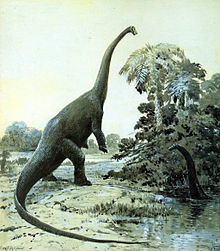 Most life restorations of sauropods in art through the first three quarters of the 20th century depicted them fully or partially immersed in water. This early notion was cast in doubt beginning in the 1950s, when a study by Kermack (1951) demonstrated that, if the animal were submerged in several metres of water, the pressure would be enough to fatally collapse the lungs and airway. However, this and other early studies of sauropod ecology were flawed in that they ignored a substantial body of evidence that the bodies of sauropods were heavily permeated with air sacs. In 1878, paleontologist E.D. Cope had even referred to these structures as "floats". Beginning in the 1970s, the effects of sauropod air sacs on their supposed aquatic lifestyle began to be explored. Paleontologists such as Coombs and Bakker used this, as well as evidence from sedimentology and biomechanics, to show that sauropods were primarily terrestrial animals. In 2004, D.M. Henderson noted that, due to their extensive system of air sacs, sauropods would have been buoyant and would not have been able to submerge their torsos completely below the surface of the water; in other words, they would float, and would not have been in danger of lung collapse due to water pressure when swimming. Evidence for swimming in sauropods comes from fossil trackways that have occasionally been found to preserve only the forefeet (manus) impressions. Henderson showed that such trackways can be explained by sauropods with long forelimbs (such as macronarians) floating in relatively shallow water deep enough to keep the shorter hind legs free of the bottom, and using the front limbs to punt forward. However, due to their body proportions, floating sauropods would also have been very unstable and maladapted for extended periods in the water. This mode of aquatic locomotion, combined with its instability, led Henderson to refer to sauropods in water as "tipsy punters". While sauropods could therefore not have been aquatic as historically depicted, there is evidence that they preferred wet and coastal habitats. 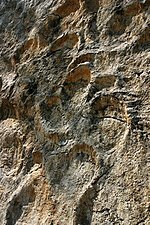 Sauropod footprints are commonly found following coastlines or crossing floodplains, and sauropod fossils are often found in wet environments or intermingled with fossils of marine organisms. A good example of this would be the massive Jurassic sauropod trackways found in lagoon deposits on Scotland's Isle of Skye. Some sauropods, such as Alamosaurus sanjuanensis, formed herds segregated by age. Many lines of fossil evidence, from both bone beds and trackways, indicate that sauropods were gregarious animals that formed herds. However, the makeup of the herds varied between species. Some bone beds, for example a site from the Middle Jurassic of Argentina, appear to show herds made up of individuals of various age groups, mixing juveniles and adults. However, a number of other fossil sites and trackways indicate that many sauropod species travelled in herds segregated by age, with juveniles forming herds separate from adults. Such segregated herding strategies have been found in species such as Alamosaurus, Bellusaurus and some diplodocids. In a review of the evidence for various herd types, Myers and Fiorillo attempted to explain why sauropods appear to have often formed segregated herds. Studies of microscopic tooth wear show that juvenile sauropods had diets that differed from their adult counterparts, so herding together would not have been as productive as herding separately, where individual herd members could forage in a coordinated way. The vast size difference between juveniles and adults may also have played a part in the different feeding and herding strategies. Since the segregation of juveniles and adults must have taken place soon after hatching, and combined with the fact that sauropod hatchlings were most likely precocial, Myers and Fiorillo concluded that species with age-segregated herds would not have exhibited much parental care. On the other hand, scientists who have studied age-mixed sauropod herds suggested that these species may have cared for their young for an extended period of time before the young reached adulthood. A 2014 study suggested that the time from laying the egg to the time of the hatching was likely to have been between 65 and 82 days. Exactly how segregated versus age-mixed herding varied across different groups of sauropods is unknown. Further examples of gregarious behavior will need to be discovered from more sauropod species to begin detecting possible patterns of distribution. Restoration of a rearing Diplodocus by Charles R. Knight, 1911. Since early in the history of their study, scientists, such as Osborn, have speculated that sauropods could rear up on their hind legs, using the tail as the third 'leg' of a tripod. 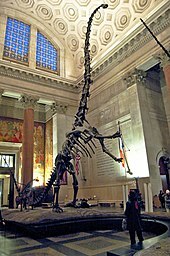 A skeletal mount depicting the diplodocid Barosaurus lentus rearing up on its hind legs at the American Museum of Natural History is one illustration of this hypothesis. In a 2005 paper, Rothschild and Molnar reasoned that if sauropods had adopted a bipedal posture at times, there would be evidence of stress fractures in the forelimb 'hands'. However, none were found after they examined a large number of sauropod skeletons. Heinrich Mallison (in 2009) was the first to study the physical potential for various sauropods to rear into a tripodal stance. Mallison found that some characters previously linked to rearing adaptations were actually unrelated (such as the wide-set hip bones of titanosaurs) or would have hindered rearing. For example, titanosaurs had an unusually flexible backbone, which would have decreased stability in a tripodal posture and would have put more strain on the muscles. Likewise, it is unlikely that brachiosaurids could rear up onto the hind legs, as their center of gravity was much farther forward than other sauropods, which would cause such a stance to be unstable. Diplodocids, on the other hand, appear to have been well adapted for rearing up into a tripodal stance. Diplodocids had a center of mass directly over the hips, giving them greater balance on two legs. Diplodocids also had the most mobile necks of sauropods, a well-muscled pelvic girdle, and tail vertebrae with a specialised shape that would allow the tail to bear weight at the point it touched the ground. Mallison concluded that diplodocids were better adapted to rearing than elephants, which do so occasionally in the wild. He also argues that stress fractures in the wild do not occur from everyday behaviour, such as feeding-related activities (contra Rothschild and Molnar). There is controversy over how sauropods held their heads and necks, and the postures they could achieve in life. Various research looking at the problem from aspects, such as the neutral articulation of the neck vertebra and estimating the range of motion, the metabolic and energy requirements of having incredibly long necks, and comparison to living animals, have come to different conclusions. The claim that the long necks of sauropods were used for browsing high trees has been questioned on the basis of calculations of the energy needed to create the arterial blood pressure for the head if it was held upright. These calculations suggest this would have taken up roughly half of its energy intake. Further, to supply blood to the head vertically held high would have required blood pressure of around 700 mmHg (= 0.921 bar) at the heart. This would have needed hearts 15 times the size of the hearts of whales of similar size. This has been used to argue that it was more likely that the long neck was usually held horizontally to enable them to feed on plants over a very wide area without needing to move their bodies—a potentially large saving in energy for 30 to 40 ton animals. In support of this, reconstructions of the necks of Diplodocus and Apatosaurus show that they are basically straight with a gentle decline orientating their heads and necks in a "neutral, undeflected posture". However, research on living animals has argued that most living tetrapods habitually raise the base of their necks when alert. Inference from bones about "neutral postures", which suggest a more horizontal position, may be unreliable. Research published in 2013 that studied ostrich necks, however, took the estimated flexibility of sauropod necks into doubt. Studies by Matthew Cobley et al revealed, using computer modeling, that muscle attachments and cartilage present in the neck would likely have limited the flexibility to a considerable degree. The authors cautioned against estimating range of motion from just using the bones alone. This discovery also reveals that sauropods may have had to move their whole bodies around to better access areas where they could graze and browse on vegetation. 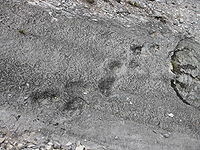 Sauropod trackways and other fossil footprints (known as "ichnites") are known from abundant evidence present on most continents. Ichnites have helped support other biological hypotheses about sauropods, including general fore and hind foot anatomy (see Limbs and feet above). Generally, prints from the forefeet are much smaller than the hind feet, and often crescent-shaped. Occasionally ichnites preserve traces of the claws, and help confirm which sauropod groups lost claws or even digits on their forefeet. Sauropod tracks from the Villar del Arzobispo Formation of early Berriasian age in Spain support the gregarious behaviour of the group. The tracks are possibly more similar to Sauropodichnus giganteus than any other ichnogenera, although they have been suggested to be from a basal titanosauriform. The tracks are wide-gauge, and the grouping as close to Sauropodichnus is also supported by the manus-to-pes distance, the morphology of the manus being kidney bean-shaped, and the morphology of the pes being subtriangular. It cannot be identified whether the footprints of the herd were caused by juveniles or adults, because of the lack of previous trackway individual age identification. Generally, sauropod trackways are divided into three categories based on the distance between opposite limbs: narrow gauge, medium gauge, and wide gauge. The gauge of the trackway can help determine how wide-set the limbs of various sauropods were and how this may have impacted the way they walked. A 2004 study by Day and colleagues found that a general pattern could be found among groups of advanced sauropods, with each sauropod family being characterised by certain trackway gauges. They found that most sauropods other than titanosaurs had narrow-gauge limbs, with strong impressions of the large thumb claw on the forefeet. Medium gauge trackways with claw impressions on the forefeet probably belong to brachiosaurids and other primitive titanosauriformes, which were evolving wider-set limbs but retained their claws. Primitive true titanosaurs also retained their forefoot claw but had evolved fully wide gauge limbs. Wide gauge limbs were retained by advanced titanosaurs, trackways from which show a wide gauge and lack of any claws or digits on the forefeet. Occasionally, only trackways from the forefeet are found. Falkingham et al. used computer modelling to show that this could be due to the properties of the substrate. These need to be just right to preserve tracks. Differences in hind limb and fore limb surface area, and therefore contact pressure with the substrate, may sometimes lead to only the forefeet trackways being preserved. In a study published in PLoS ONE on October 30, 2013, by Bill Sellers, Rodolfo Coria, Lee Margetts et al., Argentinosaurus was digitally reconstructed to test its locomotion for the first time. Before the study, the most common way of estimating speed was through studying bone histology and ichnology. Commonly, studies about sauropod bone histology and speed focus on the postcranial skeleton, which holds many unique features, such as an enlarged process on the ulna, a wide lobe on the ilia, an inward-slanting top third of the femur, and an extremely ovoid femur shaft. Those features are useful when attempting to explain trackway patterns of graviportal animals. When studying ichnology to calculate sauropod speed, there are a few problems, such as only providing estimates for certain gaits because of preservation bias, and being subject to many more accuracy problems. To estimate the gait and speed of Argentinosaurus, the study performed a musculoskeletal analysis. The only previous musculoskeletal analysises were conducted on hominoids, terror birds, and other dinosaurs. Before they could conduct the analysis, the team had to create a digital skeleton of the animal in question, show where there would be muscle layering, locate the muscles and joints, and finally find the muscle properties before finding the gait and speed. The results of the biomechanics study revealed that Argentinosaurus was mechanically competent at a top speed of 2 m/s (5 mph) given the great weight of the animal and the strain that its joints were capable of bearing. The results further revealed that much larger terrestrial vertebrates might be possible, but would require significant body remodeling and possible sufficient behavioral change to prevent joint collapse. Sauropods are gigantic, and descendants of surprisingly small ancestors. Basal dinosauriformes, such as Pseudolagosuchus and Marasuchus from the Middle Triassic of Argentina, weighed approximately 1 kg (2.2 lb) or, in most cases, less. At the evolutionary point named Saurischia, a rapid increase of bauplan size appeared, although more primitive members like Eoraptor, Panphagia, Pantydraco, Saturnalia and Guaibasaurus still retain a moderate size, possibly even less than 10 kg (22 lb). Even with these small, primitive forms, there is a notable size growth in sauropodomorphs, although scanty remains of this period of sauropod evolution make assumptions necessary as the size is difficult to interpret. There is one definite example of a derived sauropodomorph being small however, and that is Anchisaurus, which reached under 50 kg (110 lb), even though it is closer to the sauropods than Plateosaurus and Riojasaurus, which were upwards of 1 t (0.98 long tons; 1.1 short tons) in weight. Compared to even derived sauropodomorphs, sauropods were huge. Their even larger size probably resulted because of an increased growth rate, which appears to have been linked with tachymetabolic endothermy, a condition that evolved in sauropodomorphs. Once branched into sauropods, sauropodomorphs continued steadily to grow larger, with smaller sauropods, like the Early Jurassic Barapasaurus and Kotasaurus, evolving into even larger forms like the Middle Jurassic Mamenchisaurus and Patagosaurus. Following the size change of sauropods, theropods continued to grow even larger, shown by an Allosaurus-sized coelophysoid from Germany. As one possible explanation for the increased body size is less risk of predation, the size evolution of both sauropods and theropods are probably linked. Neosauropoda is quite plausibly the largest clade of dinosaurs ever to have existed, with a few exceptions. Most exceptions are hypothesized to be caused by island dwarfism, although there is a trend in Titanosauria towards a smaller body size. The titanosaurs, however, have also been some of the largest sauropods ever. Other than titanosaurs, a clade of diplodocoids, a group of giants, called Dicraeosauridae, is diagnosed by a small body size. No sauropods were very small, however, for even "dwarf" sauropods are larger than 500 kg (1,100 lb), a size reached by only about 10% of all mammalian species. Although in general, sauropods were large, a gigantic size (40 t (39 long tons; 44 short tons) or more) was reached independently at multiple times in their evolution. Many gigantic forms existed in the Late Jurassic (specifically Kimmeridgian and Turonian), such as the turiasaur Turiasaurus and the diplodocoids Amphicoelias, Diplodocus and Supersaurus. Through the Early to Late Cretaceous, the giants Sauroposeidon, Paralititan, Argentinosaurus, Puertasaurus, Antarctosaurus giganteus, Dreadnoughtus schrani, Notocolossus and Futalognkosaurus lived, the earliest being a brachiosaurid, with all latter being titanosaurs. One sparsely known possible giant is Huanghetitan ruyangensis, only known from 3 m (9.8 ft) long ribs. All of the giant genera and species lived in the Late Jurassic to the Late Cretaceous, over a time span of 85 million years, and are independently evolved neosauropods. Insular dwarfism is caused by a reduced growth rate in sauropods, the opposite of which led to the evolution of sauropods. Two well-known island dwarfs are the Cretaceous Magyarosaurus (at one point its identity as a dwarf was challenged) and the Jurassic Europasaurus, both from Europe. Even though these sauropods are small, the only way to prove they are true dwarfs is through a study of their bone histology. A study by Martin Sander and colleagues in 2006 examined eleven individuals of Europasaurus holgeri using bone histology and demonstrated that the small island species evolved through a decrease in the growth rate of long bones as compared to rates of growth in ancestral species on the mainland. Two other possible dwarfs are Rapetosaurus, which existed on the island of Madagascar, an isolated island in the Cretaceous, and Ampelosaurus, a titanosaur that lived on the Iberian peninsula of southern Spain and France. The possible Cetiosauriscus from Switzerland might also be a dwarf, but it has yet to be proven. One of the most extreme cases of island dwarfism is found in Europasaurus, a relative of the much larger Camarasaurus and Brachiosaurus, was about 6.2 m (20 ft) long, and so the diminutive size of Europasaurus is considered to be diagnostic of the genus. The cause of the size reduction found by the authors was a reduced growth rate, which is now considered to be why all dwarfs are so small. The first scrappy fossil remains now recognized as sauropods all came from England and were originally interpreted in a variety of different ways. Their relationship to other dinosaurs was not recognized until well after their initial discovery. The first reconstruction of a sauropod, the skeleton of Camarasaurus supremus. By John A. Ryder, 1877. The first sauropod fossil to be scientifically described was a single tooth known by the non-Linnaean descriptor Rutellum implicatum. This fossil was described by Edward Lhuyd in 1699, but was not recognized as a giant prehistoric reptile at the time. Dinosaurs would not be recognized as a group until over a century later. Richard Owen published the first modern scientific description of sauropods in 1841, in his paper naming Cetiosaurus and Cardiodon. Cardiodon was known only from two unusual, heart-shaped teeth (from which it got its name), which could not be identified beyond the fact that they came from a previously unknown large reptile. Cetiosaurus was known from slightly better, but still scrappy remains. Owen thought at the time that Cetiosaurus was a giant marine reptile related to modern crocodiles, hence its name, which means "whale lizard". A year later, when Owen coined the name Dinosauria, he did not include Cetiosaurus and Cardiodon in that group. In 1850, Gideon Mantell recognized the dinosaurian nature of several bones assigned to Cetiosaurus by Owen. Mantell noticed that the leg bones contained a medullary cavity, a characteristic of land animals. He assigned these specimens to the new genus Pelorosaurus, and grouped it together with the dinosaurs. However, Mantell still did not recognize the relationship to Cetiosaurus. The next sauropod find to be described and misidentified as something other than a dinosaur were a set of hip vertebrae described by Harry Seeley in 1870. Seeley found that the vertebrae were very lightly constructed for their size and contained openings for air sacs (pneumatization). Such air sacs were at the time known only in birds and pterosaurs, and Seeley considered the vertebrae to come from a pterosaur. He named the new genus Ornithopsis, or "bird face" because of this. When more complete specimens of Cetiosaurus were described by Phillips in 1871, he finally recognized the animal as a dinosaur related to Pelorosaurus. However, it was not until the description of new, nearly complete sauropod skeletons from the United States (representing Apatosaurus and Camarasaurus) later that year that a complete picture of sauropods emerged. An approximate reconstruction of a complete sauropod skeleton was produced by artist John A. Ryder, hired by paleontologist E.D. Cope, based on the remains of Camarasaurus, though many features were still inaccurate or incomplete according to later finds and biomechanical studies. Also in 1877, Richard Lydekker named another relative of Cetiosaurus, Titanosaurus, based on an isolated vertebra. In 1878, the most complete sauropod yet was found and described by Othniel Charles Marsh, who named it Diplodocus. With this find, Marsh also created a new group to contain Diplodocus, Cetiosaurus, and their increasing roster of relatives to differentiate them from the other major groups of dinosaurs. Marsh named this group Sauropoda, or "lizard feet". 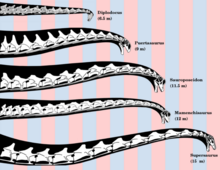 Several macronarian sauropods; from left to right, Camarasaurus, Brachiosaurus, Giraffatitan, and Euhelopus. Classification of the sauropods has largely stabilised in recent years, though there are still some uncertainties, such as the placement of Euhelopus, Haplocanthosaurus, Jobaria and Nemegtosauridae. Cladogram after an analysis presented by Sander and colleagues in 2011. ^ Holtz, Thomas R. Jr. (2012). Dinosaurs: The Most Complete, Up-to-Date Encyclopedia for Dinosaur Lovers of All Ages (PDF). Random House. ^ See analogous pronunciation of "gastropoda - definition of gastropoda in English from the Oxford dictionary". OxfordDictionaries.com. Retrieved 2016-01-20. ^ "sauropod". Dictionary.com Unabridged. Random House. ^ Tschopp, E.; Mateus, O.; Benson, R. B. J. (2015). "A specimen-level phylogenetic analysis and taxonomic revision of Diplodocidae (Dinosauria, Sauropoda)". PeerJ. 3: e857. doi:10.7717/peerj.857. PMC 4393826. PMID 25870766. ^ Lallensack, JN, Klein H, Milàn J, Wings O, Mateus O, Clemmensen LB. 2017. Sauropodomorph dinosaur trackways from the Fleming Fjord Formation of East Greenland: Evidence for Late Triassic sauropods. Acta Palaeontologica Polonica. 62(4):833-843. ^ Fernando E. Novas (2009). The Age of Dinosaurs in South America. Indiana University Press. p. 181. ISBN 978-0-253-35289-7. ^ Oklahoma Geology Notes. Oklahoma Geological Survey. 2003. p. 40. ^ Beau Riffenburgh (2007). Encyclopedia of the Antarctic. Taylor & Francis. p. 415. ISBN 978-0-415-97024-2. ^ J. J. Alistair Crame; Geological Society of London (1989). Origins and Evolution of the Antarctic Biota. Geological Society. p. 132. ISBN 978-0-903317-44-3. ^ Marsh, O.C. (1878). "Principal characters of American Jurassic dinosaurs. Part I"". American Journal of Science and Arts. 16 (95): 411–416. doi:10.2475/ajs.s3-16.95.411. ^ Tidwell, V., Carpenter, K. & Meyer, S. 2001. New Titanosauriform (Sauropoda) from the Poison Strip Member of the Cedar Mountain Formation (Lower Cretaceous), Utah. In: Mesozoic Vertebrate Life. D. H. Tanke & K. Carpenter (eds.). Indiana University Press, Eds. D.H. Tanke & K. Carpenter. Indiana University Press. 139-165. ^ Bakker, Robert (1994). "The Bite of the Bronto". Earth. 3 (6): 26–33. ^ Peterson, Ivars (March 2000). "Whips and Dinosaur Tails". Science News. Archived from the original on 2007-07-14. Retrieved 2007-07-07. ^ Lovelace, David M.; Hartman, Scott A.; Wahl, William R. (2007). "Morphology of a specimen of Supersaurus (Dinosauria, Sauropoda) from the Morrison Formation of Wyoming, and a re-evaluation of diplodocid phylogeny". Arquivos do Museu Nacional. 65 (4): 527–544. ^ a b Carpenter, K. (2006). "Biggest of the big: a critical re-evaluation of the mega-sauropod Amphicoelias fragillimus". New Mexico Museum of Natural History and Science Bulletin. 36: 131–138. ^ a b Cary Woodruff & John R Foster (July 15, 2015). "The fragile legacy of Amphicoelias fragillimus (Dinosauria: Sauropoda; Morrison Formation - Latest Jurassic)" (PDF). PeerJ PrePrints. 3: e1037. ^ Jianu, Coralia-Maria; Weishampel, David B. (1999). "The smallest of the largest: a new look at possible dwarfing in sauropod dinosaurs". Geologie en Mijinbouw. 78. ^ a b c Sellers, W. I.; Margetts, L.; Coria, R. A. B.; Manning, P. L. (2013). Carrier, David (ed.). "March of the Titans: The Locomotor Capabilities of Sauropod Dinosaurs". PLoS ONE. 8 (10): e78733. doi:10.1371/journal.pone.0078733. PMC 3864407. PMID 24348896. ^ Fredriksson, G. M. (2005). "Predation on Sun Bears by Reticulated Python in East Kalimantan, Indonesian Borneo". Raffles Bulletin of Zoology. 53 (1): 165–168. ^ Roach, J. (2006), "Giant Dinosaur Discovered in Argentina", National Geographic News, 28 July 2006. http://news.nationalgeographic.com/news/2006/07/060728-giant-dinosaur.html, accessed 23 May 2008. ^ "The Giant that Never Was: Bruhathkayosaurus". January 1, 2012. ^ Larramendi, A. (2015). "Shoulder height, body mass and shape of proboscideans" (PDF). Acta Palaeontologica Polonica. 60. doi:10.4202/app.00136.2014. ^ Martin Sander, P.; Mateus, Octávio; Laven, Thomas; Knötschke, Nils (2006). "Bone histology indicates insular dwarfism in a new Late Jurassic sauropod dinosaur". Nature. 441 (7094): 739–41. doi:10.1038/nature04633. PMID 16760975. ^ Nicole Klein (2011). Biology of the Sauropod Dinosaurs: Understanding the Life of Giants. Indiana University Press. p. 73. ISBN 978-0-253-35508-9. ^ Reitner, Joachim; Yang, Qun; Wang, Yongdong; Reich, Mike (6 September 2013). Palaeobiology and Geobiology of Fossil Lagerstätten through Earth History: A Joint Conference of the "Paläontologische Gesellschaft" and the "Palaeontological Society of China", Göttingen, Germany, September 23-27, 2013. Universitätsverlag Göttingen. p. 21. ISBN 978-3-86395-135-1. ^ Palazzo, Chiara (28 March 2017). "World's biggest dinosaur footprints found in 'Australia's Jurassic Park'". The Telegraph. ^ Bonnan, M.F. 2005. Pes anatomy in sauropod dinosaurs: implications for functional morphology, evolution, and phylogeny; pp. 346-380 in K. Carpenter and V. Tidwell (eds. ), Thunder-Lizards: The Sauropodomorph Dinosaurs. Bloomington, IN: Indiana University Press. ^ a b Bonnan, Matthew F. (2003). "The evolution of manus shape in sauropod dinosaurs: Implications for functional morphology, forelimb orientation, and phylogeny". Journal of Vertebrate Paleontology. 23 (3): 595–613. doi:10.1671/A1108. ^ Upchurch, P. (1994). "Manus claw function in sauropod dinosaurs". Gaia. 10: 161–171. ^ a b Apesteguía, S. (2005). "Evolution of the titanosaur metacarpus". Pp. 321-345 in Tidwell, V. and Carpenter, K. (eds.) Thunder-Lizards: The Sauropodomorph Dinosaurs. Indianapolis: Indiana University Press. ^ Milàn, J.; Christiansen, P.; Mateus, O. (2005). "A three-dimensionally preserved sauropod manus impression from the Upper Jurassic of Portugal: implications for sauropod manus shape and locomotor mechanics". Kaupia. 14: 47–52. ^ Bonnan, M. F. (2004). "Morphometric Analysis of Humerus and Femur Shape in Morrison Sauropods: Implications for Functional Morphology and Paleobiology". Paleobiology. 30 (3): 444–470. doi:10.1666/0094-8373(2004)030<0444:maohaf>2.0.co;2. JSTOR 4096900. ^ Bonnan, Matthew F. (2007). "Linear and Geometric Morphometric Analysis of Long Bone Scaling Patterns in Jurassic Neosauropod Dinosaurs: Their Functional and Paleobiological Implications". The Anatomical Record. 290 (9): 1089–1111. doi:10.1002/ar.20578. PMID 17721981. ^ Wedel, M.J. (2009). "Evidence for bird-like air sacs in Saurischian dinosaurs". (pdf) Journal of Experimental Zoology, 311A: 18pp. ^ Taylor, M.P. ; Wedel, M.J. (2013). "Why sauropods had long necks; and why giraffes have short necks". PeerJ. 1: e36. doi:10.7717/peerj.36. PMC 3628838. PMID 23638372. ^ a b c d e Taylor, M.P. (2010). "Sauropod dinosaur research: a historical review". In Richard Moody, Eric Buffetaut, David M. Martill and Darren Naish (eds. ), Dinosaurs (and other extinct saurians): a historical perspective. HTML abstract. ^ a b Barber, Elizabeth (2004-06-09). "No toothbrush required: Dinosaurs replaced their smile every month". Christian Science Monitor. Retrieved 2013-08-14. ^ a b Taylor, M.P. ; Wedel, M.J. (2013). "Why sauropods had long necks; and why giraffes have short necks". PeerJ. 1: e36. doi:10.7717/peerj.36. PMC 3628838. PMID 23638372. ^ Stevens, K.A. (2013). "The Articulation of Sauropod Necks: Methodology and Mythology". PLOS ONE. 8 (10): e78572. doi:10.1371/journal.pone.0078572. PMC 3812995. PMID 24205266. ^ a b c d e f g h Sander, P. Martin; Christian, Andreas; Clauss, Marcus; Fechner, Regina; Gee, Carole T.; Griebeler, Eva-Maria; Gunga, Hanns-Christian; Hummel, Jürgen; Mallison, Heinrich; Perry, Steven F.; et al. (2011). "Biology of the sauropod dinosaurs: the evolution of gigantism". Biological Reviews. 86 (1): 117–155. doi:10.1111/j.1469-185X.2010.00137.x. ISSN 1464-7931. PMC 3045712. PMID 21251189. ^ Henderson, D.M. (2013). "Sauropod Necks: Are They Really for Heat Loss?". PLOS ONE. 8 (10): e77108. doi:10.1371/journal.pone.0077108. PMC 3812985. PMID 24204747. ^ a b c d e Henderson, D.M. (2004). "Tipsy punters: sauropod dinosaur pneumaticity, buoyancy and aquatic habits". Proceedings of the Royal Society of London B. 271: S180–S183. doi:10.1098/rsbl.2003.0136. PMC 1810024. PMID 15252977. ^ Kermack, K.A. (1951). "A note on the habits of sauropods". Ann. Mag. Nat. Hist. 4 (44): 830–832. doi:10.1080/00222935108654213. ^ "Giant wading sauropod discovery made on Isle of Skye (Wired UK)". Wired UK. 2015-12-02. Retrieved 2016-03-22. ^ a b c d Myers, T.S. ; Fiorillo, A.R. (2009). "Evidence for gregarious behavior and age segregation in sauropod dinosaurs". Palaeogeography, Palaeoclimatology, Palaeoecology. 274 (1–2): 96–104. doi:10.1016/j.palaeo.2009.01.002. ^ Coria, R.A. (1994). "On a monospecific assemblage of sauropod dinosaurs from Patagonia: implications for gregarious behavior". GAIA. 10: 209–213. ^ Ruxton, Graeme D.; Birchard, Geoffrey F.; Deeming, D. Charles (2014). "Incubation time as an important influence on egg production and distribution into clutches for sauropod dinosaurs". Paleobiology. 40 (3): 323–330. doi:10.1666/13028. ^ Osborn, H. F. (1899). "A Skeleton of Diplodocus, Recently Mounted in the American Museum". Science. 10 (259): 870–4. doi:10.1126/science.10.259.870. PMID 17788971. ^ a b Rothschild, B.M. & Molnar, R.E. (2005). "Sauropod Stress Fractures as Clues to Activity". In Carpenter, K. & Tidswell, V. (eds.). Thunder Lizards: The Sauropodomorph Dinosaurs. Indiana University Press. pp. 381–391. ISBN 978-0-253-34542-4. ^ a b Mallison, H. (2009). "Rearing for food? Kinetic/dynamic modeling of bipedal/tripodal poses in sauropod dinosaurs". P. 63 in Godefroit, P. and Lambert, O. (eds), Tribute to Charles Darwin and Bernissart Iguanodons: New Perspectives on Vertebrate Evolution and Early Cretaceous Ecosystems. Brussels. ^ Bujor, Mara (2009-05-29). "Did sauropods walk with their necks upright?". ZME Science. ^ Seymour, RS (June 2009). "Raising the sauropod neck: it costs more to get less". Biol. Lett. 5 (3): 317–9. doi:10.1098/rsbl.2009.0096. PMC 2679936. PMID 19364714. ^ Seymour, RS; Lillywhite, HB (September 2000). "Hearts, neck posture and metabolic intensity of sauropod dinosaurs". Proc. Biol. Sci. 267 (1455): 1883–7. doi:10.1098/rspb.2000.1225. PMC 1690760. PMID 11052540. ^ a b Stevens, K.A. ; Parrish, J.M. (1999). "Neck posture and feeding habits of two Jurassic sauropod dinosaurs". Science. 284 (5415): 798–800. doi:10.1126/science.284.5415.798. PMID 10221910. ^ Cobley MJ; Rayfield EJ; Barrett PM (14 August 2013). "Inter-Vertebral Flexibility of the Ostrich Neck: Implications for Estimating Sauropod Neck Flexibility". PLOS ONE. 8 (8): e72187. doi:10.1371/journal.pone.0072187. PMC 3743800. PMID 23967284. ^ n.d (2013-08-14). "Ostrich Necks Reveal Sauropod Movements, Food Habits". Science Daily. Retrieved 2013-08-16. ^ Ghose, Tia (2013-08-15). "Ouch! Long-necked dinosaurs may actually have had stiff necks". NBC News Live Science. Retrieved 2013-08-16. ^ a b Riga, B.J.G. ; Calvo, J.O. (2009). "A new wide-gauge sauropod track site from the Late Cretaceous of Mendoza, Neuquen Basin, Argentina". Palaeontology. 52 (3): 631–640. doi:10.1111/j.1475-4983.2009.00869.x. ^ Castanera, D.; Barco, J. L.; Díaz-Martínez, I.; Gascón, J. S. H.; Pérez-Lorente, F. L.; Canudo, J. I. (2011). "New evidence of a herd of titanosauriform sauropods from the lower Berriasian of the Iberian range (Spain)". Palaeogeography, Palaeoclimatology, Palaeoecology. 310 (3–4): 227–237. doi:10.1016/j.palaeo.2011.07.015. ^ Day, J.J.; Norman, D.B. ; Gale, A.S.; Upchurch, P.; Powell, H.P. (2004). "A Middle Jurassic dinosaur trackway site from Oxfordshire, UK". Palaeontology. 47 (2): 319–348. doi:10.1111/j.0031-0239.2004.00366.x. ^ Falkingham, P. L.; Bates, K. T.; Margetts, L.; Manning, P. L. (2011-02-23). "Simulating sauropod manus-only trackway formation using finite-element analysis". Biology Letters. 7 (1): 142–145. doi:10.1098/rsbl.2010.0403. ISSN 1744-9561. PMC 3030862. PMID 20591856. ^ Falkingham, P. L.; Bates, K. T.; Margetts, L.; Manning, P. L. (2011-08-07). "The 'Goldilocks' effect: preservation bias in vertebrate track assemblages". Journal of the Royal Society Interface. 8 (61): 1142–1154. doi:10.1098/rsif.2010.0634. ISSN 1742-5689. PMC 3119880. PMID 21233145. ^ Brian K. Hall; Benedikt Hallgrímsson (1 June 2011). Strickberger's Evolution. Jones & Bartlett Publishers. p. 446. ISBN 978-1-4496-4722-3. ^ Sander, P. M.; Mateus, O. V.; Laven, T.; Knötschke, N. (2006-06-08). "Bone histology indicates insular dwarfism in a new Late Jurassic sauropod dinosaur". Nature. 441 (7094): 739–741. doi:10.1038/nature04633. PMID 16760975. ^ Delair, J.B.; Sarjeant, W.A.S. (2002). "The earliest discoveries of dinosaurs: the records re-examined". Proceedings of the Geologists' Association. 113 (3): 185–197. doi:10.1016/S0016-7878(02)80022-0. ^ Lhuyd, E. (1699). Lithophylacii Britannici Ichnographia, sive lapidium aliorumque fossilium Britannicorum singulari figura insignium. Gleditsch and Weidmann: London. ^ Owen, R. (1842). "Report on British Fossil Reptiles". Part II. Report of the British Association for the Advancement of Science, Plymouth, England. ^ Phillips, J. (1871). Geology of Oxford and the Valley of the Thames. Oxford: Clarendon Press, 523 pp. ^ Osborn, H.F., and Mook, C.C. (1921). "Camarasaurus, Amphicoelias and other sauropods of Cope". Memoirs of the American Museum of Natural History, n.s. 3:247-387 and plates LX-LXXXV. Wikimedia Commons has media related to Sauropoda. Upchurch, P., Barrett, P.M. and Dodson, P. 2004. Sauropoda. In The Dinosauria, 2nd edition. D. Weishampel, P. Dodson, and H. Osmólska (eds.). University of California Press, Berkeley. Pp. 259–322.